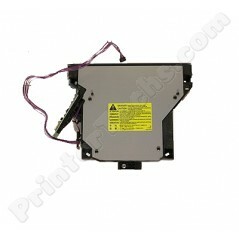 Laser scanner assembly for use in the HP LaserJet P4014, P4015, P4515 series printers. Alternate part#'s RM1-5465 , RM1-8074 , RM1-4511, RM1-7419. Common replacement part for error code 51.10 or similar. Refurbished laser scanner assembly for use in the HP LaserJet P4014, P4015 series printers. HP Part# RM1-5465.